R-value is a measure of resistance to heat flow through a given thickness of material. R-value is important, but it's just one of four key factors that determine the effectiveness of an insulation material. Insulation is primarily meant to stop the movement of heat. The problem with using R-Value as the sole measure of insulation effectiveness is that heat moves in and out of a home in four ways: by conduction (which R-Value measures), and by convection, radiation and air infiltration (none of which R-Value measures). A superior insulation system will have good R-Value (preventing heat loss via conduction), will be pneumatically or spray applied, fully filling the building cavity (preventing heat loss via convection), and will be densely packed (preventing heat loss via air infiltration and radiation). Cellulose meets all four of these critical performance criteria! There are thousands of tiny gaps, cracks and penetrations between building materials in a home. Applying air pressure of a 20 MPH wind on a 20-degree (F) day to a building, the typical R-19 batt insulated wall often performs no better than the wood studs (R-6) because of air infiltration, with heat moving around the batts through convection. In very low-density materials like loose blown fiberglass, heat will actually radiate right through the insulation, and this, along with convection, significantly reduces fiberglass' installed performance. Find more R-Value and other technical information on the U.S. Department of Energy’s energy.gov website. Need help making an insulation purchase? Click here to find CIMA producers that can refer contractors experienced and knowledgeable with cellulose insulation. 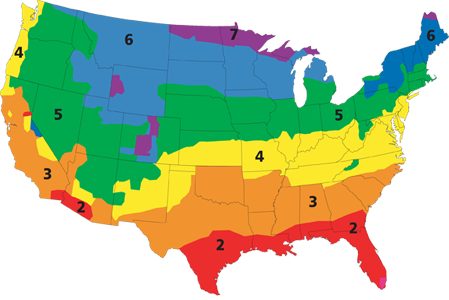 Click on this map to find insulation R-Value recommendations from the U.S. Department of Energy for your region.